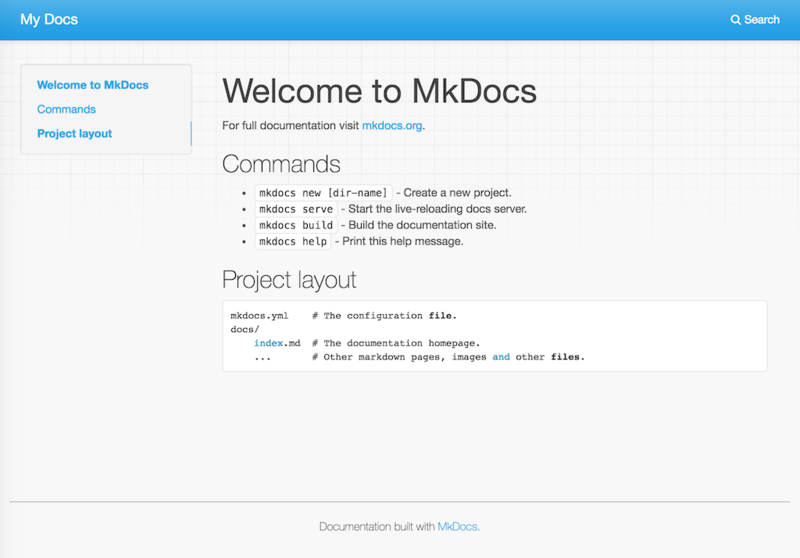 MkDocs is a great choice for building technical documentation. However, Read the Docs also supports Sphinx, another tool for writing and building documentation. This command creates mkdocs.yml which holds your MkDocs configuration, and docs/index.md which is the Markdown file that is the entry point for your documentation. This command builds your Markdown files into HTML and starts a development server to browse your documentation. Open up http://127.0.0.1:8000/ in your web browser to see your documentation. You can make changes to your Markdown files and your docs will automatically rebuild. Once you have your documentation in a public repository such as GitHub, Bitbucket, or GitLab, you can start using Read the Docs by importing your docs. Here are some external resources to help you learn more about MkDocs.